A Lil' Boy's Journey to Live…. I just wanted to catch you up on a few things-Riley’s biopsy was negative for rejection, as you know, which is perfect. Yesterday, I got back his antibody report, which shows us that Riley is NOT producing any antibodies against his heart or lungs. This is HUGE! We didn’t “expect” him to make antibodies against his heart/lungs, but there is always the chance that he could, so we check that regularly, at least with every cath/bronch. Having NO antibodies against his heart makes his risk of coronary disease a lot lower, so this is very good news. For his next cath, we would only plan to do another one at one year, unless there are any concerns. Of course, if Riley is getting a bronch sooner than that, we could consider doing a cath a little earlier. Last thing- this reaction to whatever he is reacting to!!!! We don’t know what to do about this- it’s clearly not a “contrast” thing, because he didn’t get any contrast with this last cath. Dr. Jobes doesn’t think it’s an anesthetic medication either. I am going to contact immunology again, and ask their input. They may want to see him, but I’ll let you know. The question will come up again, should we “pre medicate” him at his next procedure. I don’t know the answer to that, because even despite premedicating him in the past, he still always had the reaction, so you could argue that the premed didn’t help at all, and maybe what he needs is more “post” meds… Hopefully immunology will have an answer for us. I have yet to speak to Cardiology however I am in constant contact with Pulmonary. In speaking with Pulmonary we’ve learned that Riley’s Heart Biopsy was also NEGATIVE for Rejection! Yay! The NP in pulmonary said she would let heart transplant discuss the pathology reports though. Of course my immediate thought is .. If everything is Ok why can’t she just tell me that? Then I have to just Pray that if something did come back .. They would have called me by now! Right?! NP just said it wasn’t her place to go over the pathology reports from the heart. Ok. I get it but again .. Everything should be ok or they would have contacted me already! So we’re going to say .. All is Ok .. Because Cardiology hasn’t contacted to say otherwise. As far as the yeast … We are actually still waiting for those results. All of the other panels have seemingly come back Ok.
On a final note .. 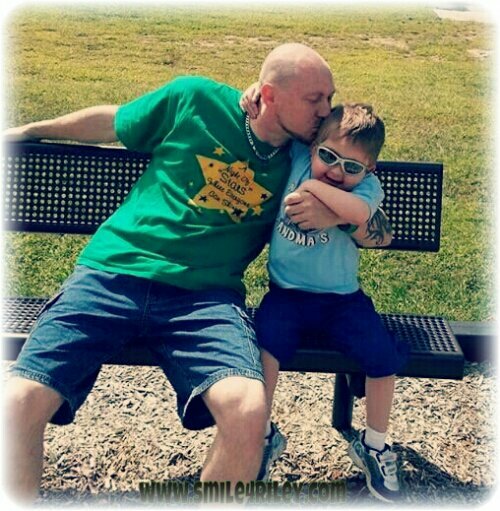 Since Riley’s donor lungs and heart were once again negative for rejection .. We can decrease his steroid dose! That’s another Yay! For every negative biopsy we will decrease his steroids! Upon discharge on Tuesday Dr Kreindler came to see us. This was in the early evening so the visit brought a little bit of anxiety with it. Some of Riley’s Very Preliminary results have come back. One was showing a form of yeast in a sample from his lungs. Dr Kreindler’s first thought is to treat but the team wants to wait for more concrete information. There is a chance that it traveled from his mouth when they were doing the Bronchoscopy. That would be the best conclusion. It could also actually be yeast in his lung! If it is Dr Kreindler’s thought is that we caught it very early because Riley isn’t really symptomatic.The plan of care is where things could become tricky. Because of the medication used to treat the yeast we would first have to pretty much cut Riley’s Tacrolimus dosage in half. (Immune Suppression Med) This med also tends to raise Creatinine levels. These are things that could ultimately put Riley into Renal Failure for a third time. Riley’s kidneys can’t handle another round of failure! This being a good reason to wait for more information. The hope is Wednesday or Thursday to know more. If it is really yeast in his lungs he will be admitted to CHOP for what should be about a week. During this time being closely monitored including daily blood draws to stay on top of his kidney function. For now we wait for results! Not only negative biopsy results but that this preliminary finding of yeast isn’t really growing in his lungs ..
Riley’s updates from Bronch/Cath/ENT .. I came across this blog on my phone as I was cleaning out my notes .. Thought I would share ..
It’s from 3 Days Post Riley’s Heart/Lung Transplant ..
March 8 2013 ~ My thoughts ..